The answer is simple; pair classic items in a new way. I will show how layering common items creates a trend. How much will I spend for the two outfits that I will create? Less than $20! The look I am recreating is the nautical look. I love Navy and White I think it looks crisp and rich. I also love dressing up or dressing down jeans. A good pair of jeans is worth what they cost! The ones in my post are Sevens For All Mankind. They retail for $178.00. Confused? How did I pay $178.00 for my jeans and still make an outfit for $20? Well, I grabbed mine at Goodwill for just $4.00. That is right, I saved $173.00. Not bad ha? 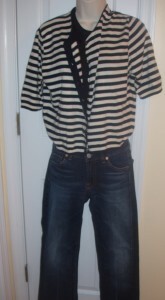 I paired the designer jeans, $4.00, with an Ann Taylor Navy Sweater, $3.50, that I layered with a striped cardigan from Banana Republic, $3.50. Total spent: $11.00. I used the same $4.00 designer jeans. I live in jeans so I try to make outfits that reflect real women. Can I wear dry clean only clothes? Not with two children! I used the same $3.50 Ann Taylor Navy Knit Tank paired with a white gauze sweater from Banana Republic, also $3.50 at Goodwill. I spent an additional $3.50 from the first look to create a second unique look. Amee of Madame Deals: I am a happily married lady living in Virginia. I enjoy raising our Angel and Cherub while staying home (well most of the time sometimes I just need an hour to myself). I love children and I hold a Master’s degree in Elementary Education with a specialization in Special Education. I have taught in several states while my husband was serving in the Navy. I hope to inspire people to believe in themselves and create a better standard of living whether it be through fashion or finance. I have to find the Goodwill you shop at because I never see those kinds of deals. I also don’t like looking around at Goodwill. I need to try to make an afternoon of it one day and go in with patience and a plan. Very cool. Love this article! I can’t wait to try this out!